Lt. Gaeta wonders: Was it suicide or murder? So, in the spirit of the British tradition of horror stories on Christmas Eve (think of all those ghosts of Christmas past, present and future in Dickens’ A Christmas Carol), our latest webisode installment, The Face of the Enemy # 5 brings us yet another murder mystery Lieutenant Felix Gaeta had better solve and quick, or he might be the next victim. That is, if he isn’t the killer himself. Read the rest of this entry ? An Eight model tells Lt. Gaeta she's got a secret plan for getting home. Note: This webisode review covers both Webisode 3 and 4. Read the rest of this entry ? Lt. Hoshi (Brad Dryborough)'s plea to rescue his missing crewman and boyfriend Lt. Felix Gaeta makes Col. Tigh (Michael Hogan)'s heart grow two sizes too big. What would you do if you had 20 hours left before all your oxygen ran out? The second installment of the “Face of the Enemy” webisodes, which premiered Dec. 12, has our characters deal with this question. It then also introduces us to what seems to be a secret in Felix Gaeta’s recent past. Read the rest of this entry ? 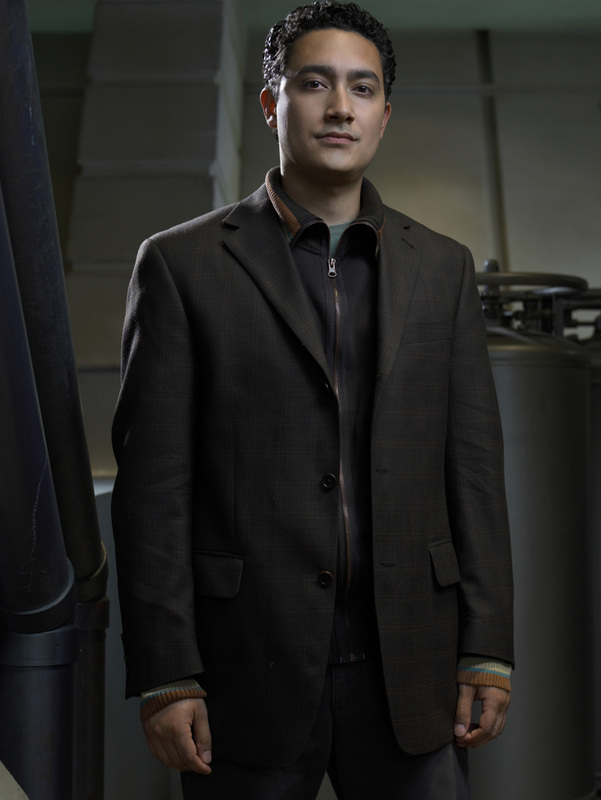 Alessandro Juliani as Lt. Felix Gaeta in the webisode series "The Face of the Enemy", which premiered Dec. 12. In part one, he already looks a lot less tidy than seen here. So for those of us who have been dying for even some scraps of BSG goodness, our wishes came true with the premiere of “The Face of the Enemy,” ten short “webisodes” that focus on one storyline starring Alessandro Juliani and featuring Grace Park. I dropped by one of my favourite magazine shops this evening and was thrilled to see Battlestar Galactica on not one but two magazine covers! One is the February 2009 issue of Sci Fi (official mag of Sci Fi Channel) and the other is TV Zone from the UK, Special #81, almost exclusively devoted to BSG. I’ve been disappointed that there hasn’t been more magazine coverage of BSG, since I have such fond memories of leafing through magazines like Starlog and Famous Monsters as a kid, eager for the latest news on whatever science fiction show or movie I was into at the time, including the original Battlestar Galactica. Back then, magazines were the only source of information for most fans and each monthly issue was savoured and examined in detail. Even I don’t buy many magazines anymore, but I’ve wondered why “Grey’s Anatomy” and “Heroes” warrant their own magazines and BSG does not. Ah well, the publicity machine is cranking up again, just in time for it all to end. I’ll be spending more time cruising the magazine aisle. Which is a good thing, except only for my wallet. You are currently browsing the The 13th Colony blog archives for December, 2008.